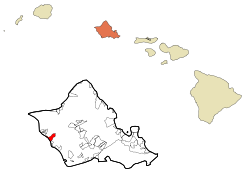 Waiʻanae is a census-designated place (CDP) in Honolulu County, Hawaii, United States. As of the 2010 Census, the CDP population was 13,177. Waiʻanae is located at 21°26′52″N 158°10′45″W﻿ / ﻿21.44778°N 158.17917°W﻿ / 21.44778; -158.17917 (21.447714, -158.179213). According to the United States Census Bureau, the CDP has a total area of 7.0 square miles (18.2 km2), of which 5.4 square miles (13.9 km2) is land and 1.7 square miles (4.4 km2), or 23.92%, is water. As of the census of 2000, there were 10,506 people, 2,595 households, and 2,221 families residing in the CDP. The population density was 3,086.0 people per square mile (1,193.1/km²). There were 2,925 housing units at an average density of 859.2 per square mile (332.2/km²). The racial makeup of the CDP was 9.35% White, 0.81% African American, 0.26% Native American, 19.44% Asian, 27.26% Pacific Islander, 0.97% from other races, and 41.92% from two or more races. Hispanic or Latino of any race were 14.00% of the population. There were 2,595 households out of which 43.9% had children under the age of 18 living with them, 58.0% were married couples living together, 19.6% had a female householder with no husband present, and 14.4% were non-families. 10.9% of all households were made up of individuals and 4.1% had someone living alone who was 65 years of age or older. The average household size was 4.04 and the average family size was 4.30. In the CDP the population was spread out with 34.8% under the age of 18, 10.4% from 18 to 24, 26.8% from 25 to 44, 19.8% from 45 to 64, and 8.2% who were 65 years of age or older. The median age was 29 years. For every 100 females there were 98.9 males. For every 100 females age 18 and over, there were 94.5 males. The median income for a household in the CDP was $46,717, and the median income for a family was $48,145. Males had a median income of $32,328 versus $22,451 for females. The per capita income for the CDP was $13,348. About 17.2% of families and 19.8% of the population were below the poverty line, including 28.6% of those under age 18 and 7.9% of those age 65 or over. The Honolulu Police Department operates a substation in Waiʻanae. In 2006 the harbormaster of Waiʻanae, William Aila, announced his candidacy for the Hawaii Democratic Party's nomination for Governor of Hawaii. Waiʻanae currently falls under the jurisdiction of the Hawaii House of Representatives' 45th district and the Hawaii Senate's 21st district. In the House of Representatives, Waiʻanae is currently represented by Jo Jordan; Maile Shimabukuro currently represents Waiʻanae in the Senate. The Hawaii Department of Education operates the public schools. District schools inside the CDP include Leihoku Elementary School, Waiʻanae Elementary School, Waiʻanae Intermediate School, and Waianae High School. The district's Kamaile Elementary School is outside of the CDP. A K-7 charter school, Ka Waihona O Ka Naʻauao - New Century Pcs, is in the CDP. Hawaii's largest homeless camp, called Pu’uhonua o Waianae, is located here. It covers an area of about 20 acres adjacent to the boat harbor. Hawaii Governor David Ige met with Twinkle Borge, the leader of Pu'uhonua o Waianae, in March 2018, committing not to sweep the camp and displace its residents, but its future remains uncertain. Max Holloway, UFC Featherweight Champion. DeForest Buckner, NFL player for San Francisco 49ers. ^ "Profile of General Population and Housing Characteristics: 2010 Demographic Profile Data (DP-1): Waianae CDP, Hawaii". U.S. Census Bureau, American Factfinder. Retrieved May 29, 2012. ^ "Geographic Identifiers: 2010 Demographic Profile Data (G001): Waianae CDP, Hawaii". U.S. Census Bureau, American Factfinder. Retrieved May 29, 2012. ^ "Contacting HPD." Honolulu Police Department. Retrieved on May 19, 2010. ^ "Waianae CDP, Hawaii." U.S. Census Bureau. Retrieved on May 21, 2009. ^ Hawaii's largest homeless camp: rock bottom or a model refuge? The Guardian, 22 June 2017, retrieved 24 December 2017. ^ "Ige meets with leader of homeless camp". Honolulu Star-Advertiser. 2018-03-31. Retrieved 2018-08-09. This page was last edited on 10 April 2019, at 03:22 (UTC).